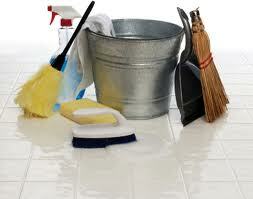 Spring cleaning is a seasonal tradition that can give your home a boost as you gear up for summer. It is also a good time to replace the batteries and test smoke and carbon monoxide detectors. Here are some tried-and-true items that may need your care this spring. Organize your seasonal storage, whether it is a shed, garage, attic or basement. Display the outdoor furniture and stow away winter items like holiday decorations, salt, snow shovels, sleds or pool cover. Store winter clothing and have your warm weather attire easily accessible. Donate any articles that you do not wear. Power wash or paint summer outdoor furniture that may appear dingy. You may want to hire professionals to clean indoor carpets and upholstery for a thorough job. Change the door mats for the season. They are your last line of defense against dirt and are an inexpensive way to spruce up entryways. Dust blinds, light fixtures, and under beds and furniture. Steam, dry clean or vacuum your curtains. Wash and wax floors to protect them against wear and tear.